Mediabank AdEx provides the easiest and most reliable asset transfer in the market. It removes the need for technical skills that are not relevant for your job situation. You will be guided trough the process with predefined templates/forms to secure that the mandatory information provided is correctly. If you need technical specification to ensure that the delivered media content conforms with your destination/receiver, just search for the relevant information in the Mediabank article library. Our broadcasters and partners use the Mediabank article library to store manuals/guides for their customer to use. You will always find the latest and updated delivery specifications available. 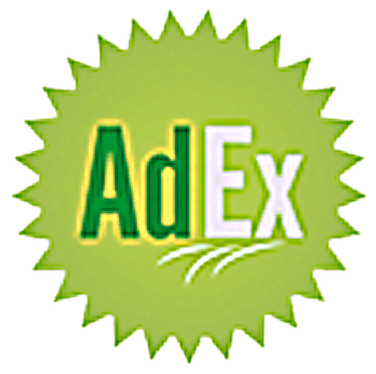 Just click on the main "MENU" in the header module from the AdEx application and enter the Documentation selection. Upon request, Mediabank can be configured to implement rules and workflows that perform simpler quality checks of the media content during upload. Contact NEP system engineers for more information if you experience other than 100% correct deliveries from your partners. We have added the option: “Save choice now and skip later” to simplify for users that frequently upload media files. By clicking in the checkbox, Mediabank will remember your previous choice and skip straight to next screen. We strongly recommend the use of Aspera to avoid corrupted media files during upload. Even interrupted transmission caused by poor or unstable internet access will automatically restart to secure the arrival of your media content. AdEx destinations are not only broadcasters or ad firms. There is a need to deliver media files to your own account as well. The present available destinations are Review & Approval or the Library application. Both external and internal producers could upload material that need an approval before it is delivered to an ad firm is one example. Done with the media file? Upload it to Library, store it on line and available for instant access. Uploaded material that are frequently used in projects may also be uploaded to the Library. It could also be a commercial or advertising clip that you may consider re-used later or in another country. If your media content (asset) already resides in Review & Approval, you can transfer (move) it to Library directly, without using AdEx. 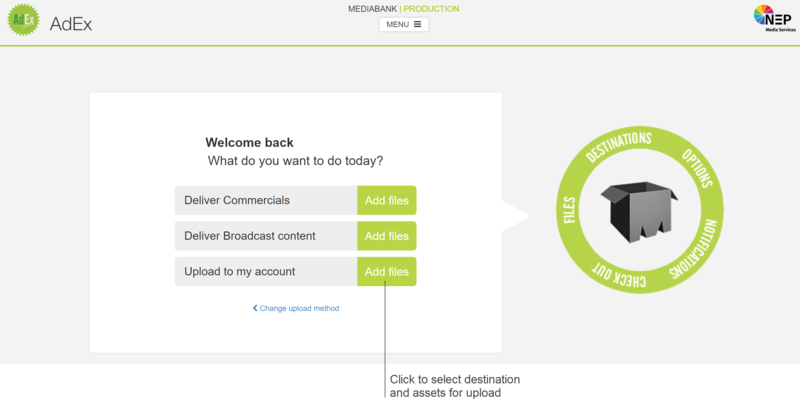 Upload media content to our own Mediabank account. A window will appear revealing your local files on your own desktop or server. Select your media file(s) and press Ok. Upload of images are also accepted. The media file(s) will appear in the “File” frame as shown below. You can choose to add additional media files for upload by pressing the “+ Add more files” button. By pressing “X” to the left of the file name, you remove it from the upload “queue” (It is not even placed in a queue at this stage). No media file is deleted. Next step is “Destination”. Click in the “select frame” and a drop down menu will appear. Select “Review & Approval” as the destination. Users with multiple accounts can choose/change the account for asset destination as shown below. The AdEex forms/templates can also use advanced workflows to automate sharing of your asset with other accounts as well. Eliminating the need for manually selecting destinations. 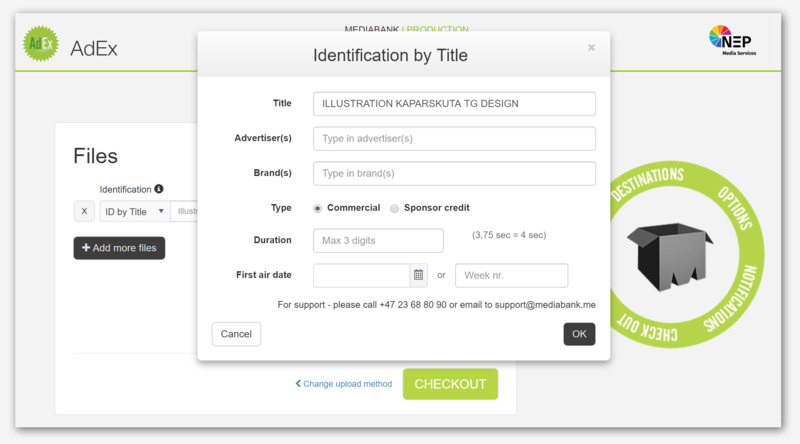 Just select the appropriate template from "destinations" in AdEx, fill in your metadata and select CHECKOUT. It is time to fill in the Metadata. Based on your selection of destination different Templates will appear. 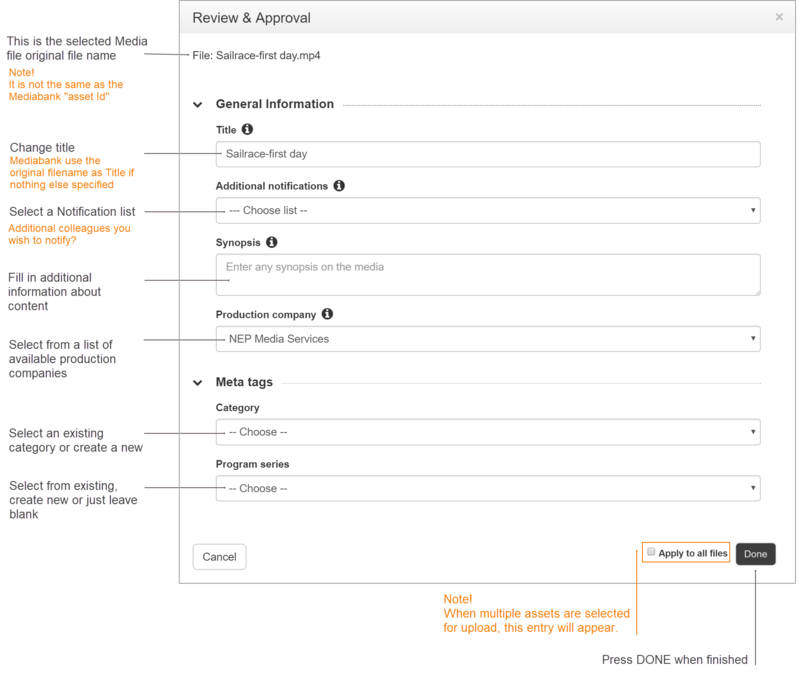 Click in the “TAG” frame to open the Review & Approval Template. Fill in the data you need to categorise it properly in Review & Approval. The filename is automatically the Title, but can easily be modified. Just write in a more proper title. The name you write here will show up in the title module above the media player. You and the predefined receiver are automatically notified, but if you wish to notify additional colleagues you just select a present list or create a new. (Modify the list from the “green wheel” and select Notifications). Write in additional text to clarify the content. It will by default select the account you are defined in. Omit it, or select the appropriate company. You can not create a production company your selves. Choose between the available categories or create a new. The new category will be available in Review & Approval automatically. Just an example on different categories you can create. This entry could be a drop down folder providing predefined program series your media content must be a part of. Did you notice the “apply to all files” entry to the left of the “DONE” button in the TAG template? If you have multiple assets for upload like the below example, Mediabank assumes that many of the entries placed in the template related to the first asset share identical content with the following assets. Marking this, will copy the content of the first asset to all of the following asset templates. Then you just have to check the other assets templates and correct the inputs that are unique. This saves a lot of time when templates are very detailed and contains a large number of entries. After pressing “Done”, you will automatically return to your previous menu. The difference is that “Tag” entry are updated with a “check mark”. Without this “check mark”, you will not be able to continue to “CHECKOUT”. We have the check mark, and just continue with “CHECKOUT”. But, before you check out…. If you decide to cancel one of the media files you can do so by pressing the "X" to the left of its file name. As shown below, pressing X will result in a pop-up menu confirming my entry removal. Just click “YES”. Remember, you just remove an entry in a list, no media content are deleted. After pressing CHECKOUT, you will be presented a confirmation window that contains the upload details for the selected assets. An additional price calculation will also be presented (Not available in below example and usually omitted with internal uploads) This is your final step before the actual upload. You still have a final opportunity to perform corrections by pressing “Go to Files”. It will take you back to previous menu allowing you to add or delete assets, or make corrections to existing inputs. If everything ok, press “CONFIRM CHECKOUT”. When you press checkout, you can follow the upload by watching the green progress bar (shown below). Press ok when the pop-up message appear. You will then be directed to AdEx main menu. The pop-up menu confirms the media content upload. However, Mediabank is still processing your media content, re-coding and making a proxy (copy) of every media file that is uploaded. The receiver will be notified of incoming media content and will be notified if the final process fails. Select type - This mandatory field is where you choose how to identify your file. In the below example, a Nielsen code is chosen. Your file DNA that contains codes which will be decoded into essential file information when checked out and uploaded. To the right of the "Select type" dropdown menu, the mediafile "Kool Kats" is ready for upload. 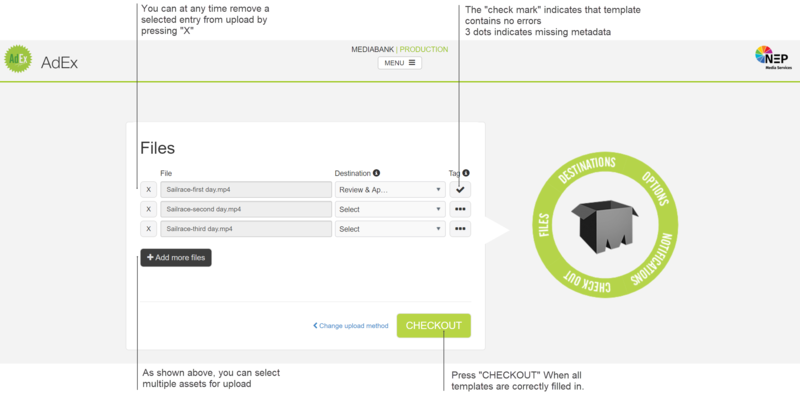 Select destination - We ship your files for you! Choose from the "Destination" drop-down. The Destination choice will lead you to Media outlets or TV channels from the drop down. To further enhance your commercial delivery, you may select multiple recipients by selecting "New" from the drop down list and combine the available destinations. From the drop down you my choose any existing lists or our standard minimum destination list. You might want to notify other about the current file status. Either by SMS or Email. Mediabank keep track of your files and it is possible for you to select which process stage you want to get notified from by creating AdEx advanced notification lists. Mediabank automatically notifies you and selected recipients of any showstopping errors in the process. This advanced functionality puts you in full control of the delivery process. Read more about it in related article: "Adex Notifications"
Still images like jpg, tif etc. is not supported when delivering commercials.